Specializing in Epoxies, Acid Stains, & Concrete Sealers. DEF is a locally owned and operated Utah flooring business, servicing areas along the Wasatch Front. DEF mainly focuses on flooring Salt Lake City, Salt Lake County, Utah County, and Park City areas. We specialize in the application and installment of epoxy flooring, acid stains, concrete sealers, deck waterproofing, and all other Utah floor applicants imaginable. Are you tired of your boring, dull, and unattractive floor? Are your garage oil stains taunting you? If so, then let DEF design your space. Acid stain is a coloring process which permanently dyes and beautifies concrete. Acid staining is a very affordable option to improve your flooring. Decks, balconies, gazebos, and pavilions are the most vulnerable exposed assets to any home or area. DEF is founded on the principles of honesty, integrity, and quality workmanship. We are constantly perfecting our craft by pursing continuing education, therefore our cutting edge approach and quality of services can not and will not be beat. This is why we are the leading flooring Utah company in the state. For almost a decade, DEF has been applying and flooring Utah with precision. Regardless of the project size, we take pride in all of our work. We accept projects large and small, commercial and residential. The mission of DEF is to have the quality of our work speak for itself. By providing lasting beautiful products and services, we believe our clients will be our best key assets by spreading the news of DEF’s amazing Utah flooring solutions. To become affiliated with DEF, please fill out the “Get A Quote” form or visit our Contact Us page for additional inquiries. We look forward to assisting you with your Utah flooring needs. 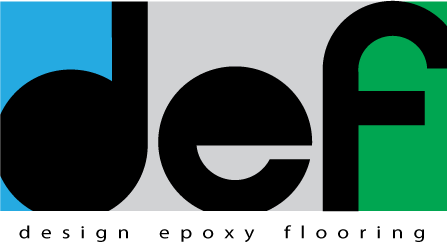 With Design Epoxy Flooring, you will truly receive a DEF floor! Epoxy is a co-polymer formed by mixing two materials, the resin or compound and the hardener or activator. After mixing the materials, the two agents form a strong durable bond. An epoxy coating makes for easy cleanup and maintenance. Acid stain is a coloring process which permanently dyes and beautifies concrete. Unlike epoxy flooring, acid stain is not a paint. Acid stain consists of water, hydrochloric acid, and acid soluble metallic salts. We look forward to assisting you and transforming your space from boring to beautiful!